This is a guest blog post from Larry First. The bio he sent me: An “experienced” (newly retired) geek from Alabama. The instructions discuss how to sync lyrics with a music video, but you could use it to transcribe the text of a tutorial as well. When presenting a music video where the vocals (message) are occasionally not perfectly intelligible, you might want to give viewers the advantage of KNOWING the words. This method is bookmark-less and trigger-less, but it works like a charm! 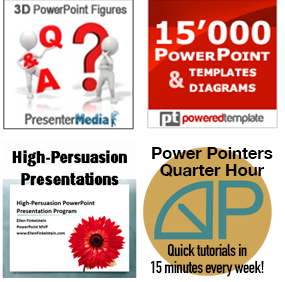 In a new PowerPoint presentation, right-click and choose Format Background. Choose the desired background and click Apply to All button. Close the dialog box, if necessary. Insert the video by choosing Insert tab, then Video or Movie, then Video on my PC, Video from File, or Movie from File (depending on your version of PowerPoint). If you prefer to have a “staging screen” that segues into the video, duplicate the first slide, and insert the video on the second slide. In PowerPoint 2007 and 2010, animated objects cannot appear in front of the video (within the video boundaries), so do not use the Play Full Screen setting. In PowerPoint 2013, you can put objects in front of a video, but you still might not want the lyrics to cover the video. At this point, you should choose whether to play the video on click or automatically. The default is on click. If you don’t see a box to choose when you insert the video, click the Playback button and choose Automatically from the Start drop-down list. Figure out the maximum vertical dimension required for the text to assure legibility and size the video to fill the remaining space. Be careful to size your video using only the corner nodes to retain its aspect (height to width) ratio. On the slide, enter the first line of lyrics, formatting it so that it shows clearly against your background. On subsequent slides, enter succeeding lines of text. Note: The subsequent slides won’t have the video on it, as you see on the right. Click on the video to select it and choose the Animations tab. In PowerPoint 2010 and 2013, click the Animation Pane button. In PowerPoint 2007, click the Custom Animation button. You’ll see the video listed. In 2010 and 2013, on the Animations tab, in the Animation gallery click the Play button (the Pause button is initially selected). In the Animation pane, you should see two items. Click the down arrow to the right of the item with the Play button on it and choose Effect Options to open the Play Video dialog box with the Effect tab displayed. Set Stop Playing After to the appropriate number of slides, depending on how many were required to insert your text. Click OK to close the dialog box. Once you’re sure that all the text is in place, click the Slide Show tab, and then click use Rehearse Timings to advance through the video at the selected pace. The video should continue playing as you go. If it doesn’t, go back and recheck the settings in the Play Video dialog box. As the video reaches the moment where the next slide of text should appear, press Enter or click the Down cursor key to advance to the next slide. In the course of the video, advance to the next slide at each subsequent moment when the appropriate text should appear. When you advance at the last slide, you’re promoted to save that Rehearse Timings session. When you go into Slide Show view, your video will start to play (automatically or on click) and will continue to play throughout the slides you specified. The slides will automatically advance according to your timing so that the text is synced with the video. Wow. It’s really pretty simple and straightforward. What a great technique. Thanks for sharing. I am definitely going to have to include that in my next “Visually Speaking” PowerPoint class. This seems also to work with audio files… one of the more time consuming tasks I’ve had is working out timing to match songs and music–this does seem to simplify that greatly! Thanks! 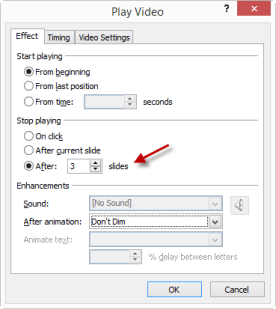 Walter, yes, you can also use this to sync an audio file (for example narration or a song) with slides. Thanks for mentioning that use. Hi, thank you very much for the lesson. Please help me, I’ve got a problem. The rehearse timing in ppt 2010 doesn’t exactly synchronise. When I put on the lyrics and done all the music stuff on the multiple slides, and then set the rehearse timing, when playback, slide nr 2 is showing before the music for slide 1 is complete. the text (lyrics to songs) does not appear in front of the video when I switch to the next slide. Is there any way to have a video play across slides as a background so it continues to play smoothly (not restart at every slide) and the text on that slide shows in front of the video? I know I can animate text boxes on the same slide, but if I have 20 slides of lyrics, this is not really workable.